My son Holden asked me to take him to McDonalds the other day. I’m not a big McDonalds guy, so when I actually agree to these types of scenarios, one of two things usually take place. Option #1: I don’t eat. Option #2: We end up someplace much better than McDonalds. I like “Option #2″ a whole lot more. So we ended up at Chilis. 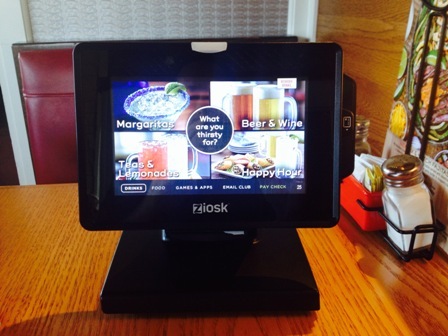 I turns out that Chilis has recently added one of these little guys to each table in their restaurants. 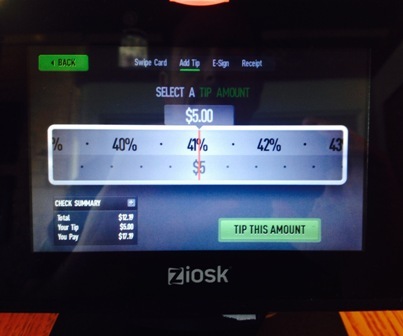 A “Ziosk,” as they’re called, is the newest form of electronic serving assistant, and they are quickly making their way into restaurants around the country. Without a doubt, it’s a pretty cool toy. I can definitely see from a marketing standpoint why Chilis makes them available. 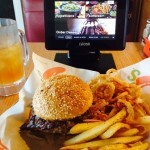 You can browse the menu, let your server know that you need a refill, order dessert, join the Chilis email club, and swipe your card and pay your bill right from the convenience of your table. And if you want to have $0.99 added to your tab, you can even play games on the console while you are waiting for your food to arrive. Alas, Gabriella and Holden lost that argument. As a consumer, I immediately started to formulate the pros and cons in my own mind of the value that these little toys bring to the dining experience. To be honest, I came up with a lot more cons. Call me old school. One of the reasons I chose to share this story with my readers is that I’m really curious to hear what you think about this new toy. Wow. Now Henry didn’t seem to me to be a lazy guy, but the first phrase that came to my mind was sanctioned mediocrity. Henry doesn’t have to feel the pressure of checking in to make sure if my drink needs refilling – after all, I can just press a button on the console and Henry knows I’m thirsty. Not a big deal, and I think the very best servers will continue to do the things that make them the very best – Ziosk or no Ziosk. But I think it does open the door for other servers to count on the client to react, as opposed to always being one step ahead of their customer – which of course is Marketing 101. 2. It’s another level of distraction to a shared dining experience. Sure, a couple out on a date could pay the $0.99 and play a few games at the table while waiting for their food. Sure, parents could throw the extra buck on the tab to keep their kids occupied and distracted until the chicken strips and pizza arrive. But do we really need another electronic gadget to encourage us to play more and talk less? 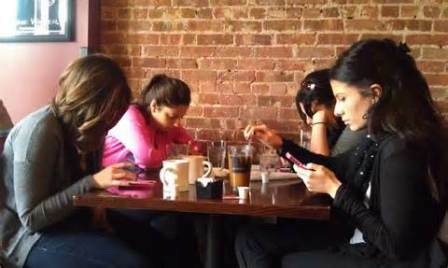 As it is, we’re already breaking out our phones at every opportunity to check Facebook, tell the world where we’re eating, tweet a picture of our food, or check that one last email. Now, I’m not against cell phones or video games. We have both in our home. I’ve been known to “check in” from a restaurant before on Facebook. But have we lost the ability to just sit and hang out – talk with our kids and ask them what happened in school? Share our day with our spouse and listen with intention as they tell us about theirs? Sorry kids – no $0.99 video games. I’m going to blink twice and you’ll both be in college. Gotta treasure these moments while we have them. 3. It effectively removes a lot of server-client interaction. I think everyone stands to lose here. After all, the restaurant business is a service-based industry. Our server Henry, although a really nice guy, wasn’t overly outgoing, so I’m betting that decreased client interaction wasn’t that big of a deal to him. I was really curious as to whether or not he had seen a change in tipping levels with the Ziosk. After all, are we less likely to tip someone well when we haven’t interacted with them all that much? And what about being able to pay your bill at the table and leave – would some be tempted to leave a lesser tip (or no tip at all) when the traditional bill “handoff” with the server had been removed? When I asked Henry about it, he said that he didn’t seem to see much of a difference. However, I decided to test my theory once again about a week later in another Chilis (all in the spirit of research, of course). This time my server was Faviola. She was great – friendly, outgoing and also willing to answer my questions about the Ziosk. And you know what? She hates it. She said that she is a people-person, and loves to interact with her clients, so she doesn’t leave it up to the Ziosk to do her work for her. She said that she insists on being attentive and present, and her actions with me totally supported her claims. Again, the Ziosk is actually is a pretty cool toy, and I certainly don’t expect everyone who reads this to feel the way I do. Some of you may think it’s an awesome addition to the dining experience, and that’s great. I’d love to hear your thoughts. After all is said and done, it’s just another tool that you can include or exclude from your dining experience. You can even wait for your server to bring you the old school check in the black book if you want. If he or she is around, that is. Henry wasn’t, and we had a to-go order in hand for my wife, Gina (a lesson in self-survival that I learned a long time ago – If you take the kids out to dinner without your spouse, never come home empty-handed). So what did I do? I swiped my debit card on the Ziosk, spun the tip dial up to 15%, and let my 9-year old daughter sign the screen. Soon after that, we left. After we were gone, Henry was left with some dirty dishes, an electronic signature that said “Gabby,” and another missed opportunity to be extraordinary. Have you used a Ziosk yet? What are your thoughts on a gadget like this? Would you consider it a nice addition to your dining experience, or an unnecessary waste of table space? Comment below and tell us!